Team has been working hard all over the weekend and the beta design of the ejtIMU is already here. 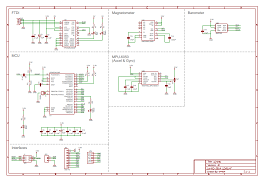 We used Sparkfun's tutorials on Eagle and on schematic design. We have also the bill of materials and are going to buy the sensors, microcontroller and FDTI during next week. We are aiming to have the first prototype integrated in 3 weeks time. Any suggestion is more than welcome. STAY TUNED !!! !